Women’s Wear Daily (WWD) confirmed that the former soccer player will be showing off his underpants along with his toned torso in a 30-second clip on TV during the big game. The clip will be aired on a prestigious slot. Some brands vie for these slots for a price of $4 million just to promote their products through advertisements during breaks of this sporting event. 38 year-old Beckham has been the major endorser of H&M Bodywear since 2012. During the big game, nine new styles will be promoted by the line with their advert. H&M stands for Hennes & Mauritz, a Swedish multinational clothing company famous for fast-fashion. They have retail-clothing lines for men, women, children and teenagers. Beckhams’s advert for H&M was filmed in London. According to reports, pictures of the sports superstar and his underwear will be bannered on the side of a particular big building. Fans, especially the ladies, are definitely excited about this advert, but Beckham himself isn’t really sure anymore on how much longer will he be posing for underwear lines half naked. He said he is getting a bit old for that. Owners of the Samsung TV can buy Beckham’s H&M underwear collection just by pressing the right button using their interactive gadget. This advert which will be aired on Fox during the Super Bowl XLVIII marks a milestone on technological TV advertising where fans can actually buy the products directly from the TV using their remote controls. However, only a very small number of audiences from America will be able to experience this historic pioneering innovation during its broadcast on Fox for the Feb 2 game. This technological advertisement feature is only available for people who own the 2012 and 2013 Samsung Smart TV. The TV should also be connected to the internet. H&M used Delivery Agent’s TV commercial platform to offer this feature to fans. Viewers and fans who have the compatible TV will be given a chance to buy the merchandise from the David Beckham’s Bodywear spring 2014 collection exclusively available through H&M. There are no statistics yet on how many compatible Samsung TVs are there in the United States. Delivery Agent is planning to showcase a demo on how the TV shopping app with H&M works on the 2014 International Consumer Electronic Show. According to Deliver Agent CEO Mike Fitzsimmons, even though the technology is limited to some viewers only, the retailer will get much advantage from it by turning their Super Bowl advertisement into an actionable feature. This idea of interactive TV shopping first came up years ago when viewers of the hit sitcom “Friends” are encouraged to buy Jennifer Aniston’s sweater. This time Beckham’s underpants will supersede Aniston’s sweater. • Doritos. This Pepsi Co-owned has its Crash the Super Bowl contest, which teams up with Marvel to promote “The Avengers: Age of Ultron.” This contest was opened for fans in an international scale for the first time, giving amateur filmmakers a chance to showcase their work during the big game on Feb 2. One of the ads is a funny short video about a mysterious finger cleaner. Watch the ad at http://www.youtube.com/watch?v=ugo7Y2lRsxc. While the other ad from the brand is about a funny tale of time travel and a little boy’s genius scheme to get the Doritos. Watch the video at http://www.youtube.com/watch?v=Y-P0Hs0ADJY. • Audi will be back for the seventh time in the Super Bowl XLVIII advertisement stage. The car brand will be promoting its luxury A3 model. • Coca-Cola is back with a goal to top its ad last year which features interactive Super Bowl push with roller skater and tap dancers. According to the brand's vice president for global advertising strategy, Jonathan Mildenhall their advertisement will celebrate the American society and the role of Coca-Cola in it. • Axe will be back, but this time Unilever is planning to follow-up on its success last year. The brand is not divulging any plans yet, but to have a wild guess, it would be best to consider what it did last time, where it conducted a competition that would launch 25 fans into space. • Volkswagen will be back in the Super Bowl ad stage for the fifth consecutive year. According to reports, the German car marque will focus their ad on telling simple human stories for the big game this Feb 2. • Jaguar will promote its F-Type Coupe against some of the big names in the American car industry. Oscar winner Tom Hooper, the director of King’s Speech will be directing the ad. The brand’s ad will feature some of the biggest British actors to star as villains in the ad. There will be plenty more advertisers during the Super Bowl XLVIII, but these are just some of the major updates. 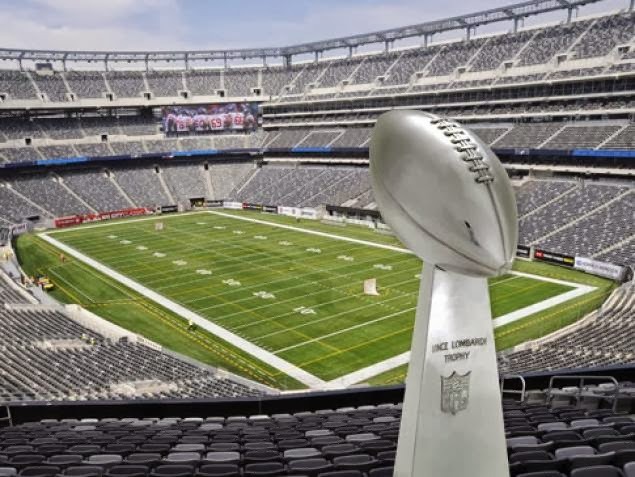 Check out the Super Bowl 2014 FAQs on I4U News to find out when the Super Bowl 2014 is, where it takes place and how you can watch it amongst many other hot Super Bowl 2014 facts.